Russia’s Kalibr cruise missiles are believed to be the land-attack version the Klub family cruise missiles, yet, not much is currently known about these variations. The 3M-14T Kalibr-NK is a land-attack cruise missile carried by Russia’s surface vessels. Reports put its max range at 1,500 – 2,500 km. In October and November 2015, Russia launched a salvo of Kalibr missiles from the Caspian Sea at ISIS targets inside Syria. The Kalibr-NK cruise missiles were launched from a Russian Gepard-class frigate and Buyan-M-class corvettes and travelled 1,500 km to reach their targets. It has been reported it is capable of carrying a 450 kg conventional or (reported) nuclear warhead. The missile is believed to fly 64 ft above the sea and 164 ft above the ground at speeds up to 965 km/hour. It is believed to be guided, using GPS and terminal-phase active radar seekers to achieve a reported three m CEP. The 3M-14K Kalibr-PL is similar to the 3M-14T except that is launched from a submarine. This variant was reported to have been launched from an improved Kilo-class submarine in the Mediterranean to strike targets inside Syria in December 2015. Russia plans to equip most of its submarines and surface ships with the respective versions of the Klub anti-ship and Kalibr land-attack cruise missiles. This will include ships in Russia’s Baltic Sea, Black Sea, Caspian Sea, Northern, and Pacific Fleets. Novator Design Bureau, the designers of the Klub launch system, have developed a shipping container version of the launcher, capable of holding up to four missiles. This shipping container version allows the cruise missile to be forward deployed on ships, trucks, and trains without detection. The Russian plan to equip its submarines and surface ships with the Kalibr cruise missile poses a serious threat to the U.S. ability to project force across the globe. The Russian ships that carried out the 2015 strike all had a displacement around or under 1,000 tons. The 26 Kalibr missiles reportedly traveled 1,800 km, a significant distance for missiles launched from such small vessels. The small size of the Russian ships that carried out the strike offers them unique strategic opportunities, not to mention the fact that these naval vessels are relatively inexpensive. Despite significant Russian ground assets in Syria capable of carrying out such a strike, Russia elected to demonstrate its improvement with a longer-range sea-based launch. According to a U.S. official, this was done intentionally to display these enhanced capabilities. Beyond the immediate ramifications of the Russian strike on Syria with Kalibr cruise missiles, the strike showed that Russia has potentially strengthened its A2/AD capabilities to further limit US military operations in contested regions, which, in turn, will allow Russia to continue conducting hybrid warfare tactics and to punch above its own weight militarily. Lewis, Jeffrey. “Sokov on Russian Cruise Missiles.” Arms Control Wonk. 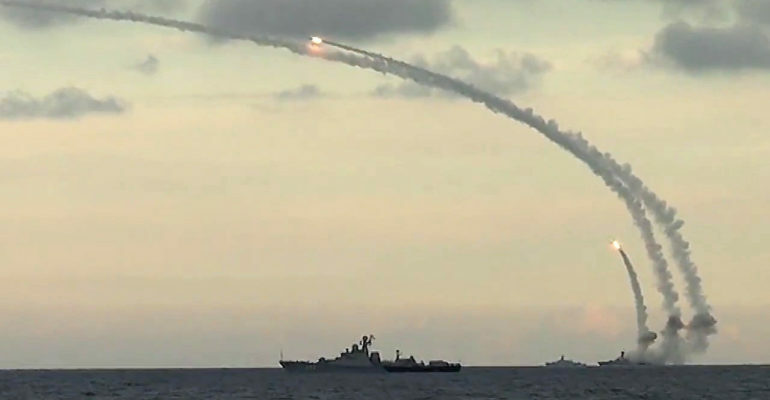 August 25, 2015. http://www.armscontrolwonk.com/archive/207801/sokov-on-russian-cruise-missiles/. Akulov, Andrei. “Kalibr: Russia’s Naval System Upping Cruise Missile Game.” Strategic Culture Foundation. May 24, 2016. http://www.strategic-culture.org/news/2016/05/24/kalibr-russia-naval-system-upping-cruise-missile-game.html. Johnson, Richard. “How Russia fired missiles at Syria from 1,000 miles away.” The Washington Post. October 23, 2015. https://www.washingtonpost.com/graphics/world/russian-cruise-missile/.